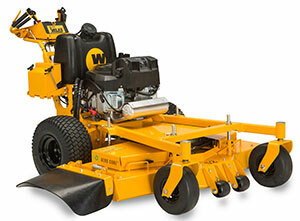 Wright Manufacturing released two new Velke hydro-powered walk-behind mower series. The HC series is available with 32-, 36- and 48-inch cutting decks. The larger LC series offers a choice between a 52-inch and a 61-inch cutting deck. The HC series is designed for medium size properties and tight spaces, and the LC models offer low impact on commercial sites even with attributes such as larger tires, reinforced frames and a wider stance, the company said. A Velke sulky latch is provided on all models. The operator has a choice of walking or riding when a Velke sulky is attached. The latch secures the sulky in a folded position when the operator chooses to walk.